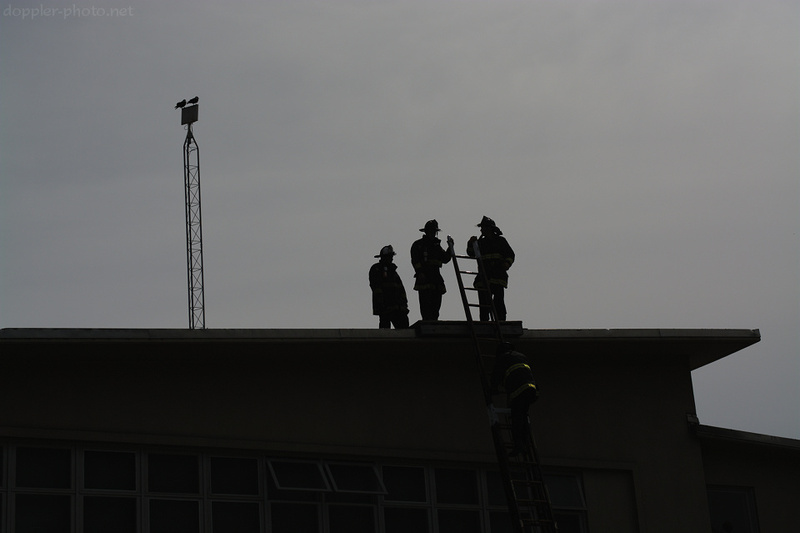 This past weekend, L and I were driving around after a track meet when I spotted a bunch of firefighters standing on the roof of their firehouse, near Stonestown Galleria. Intrigued, we stopped and walked over to take some pictures. It wasn't until I got closer, though, that I realized just how high the roof was. 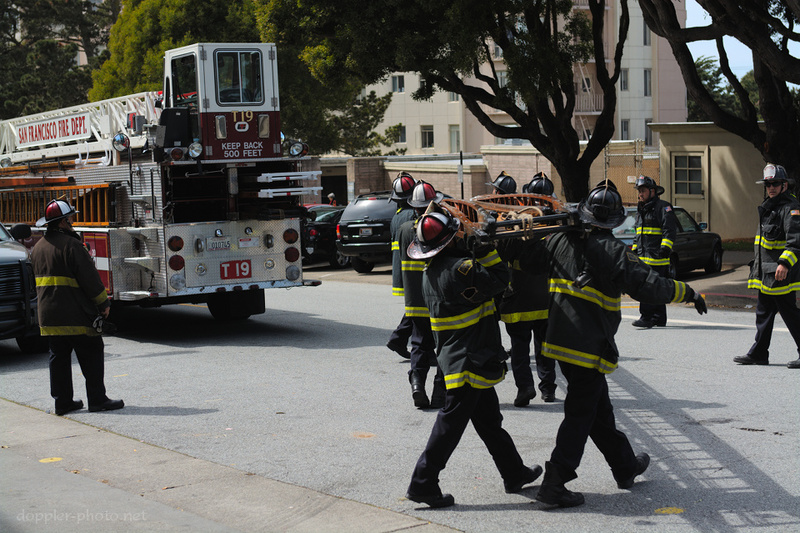 It turned out that the firefighters from multiple companies were practicing how to use and maneuver one of the San Francisco Fire Department's giant 50-foot wooden ground ladders. The ladder was extended to about 40 feet, and people were climbing down one-by-one as we approached. 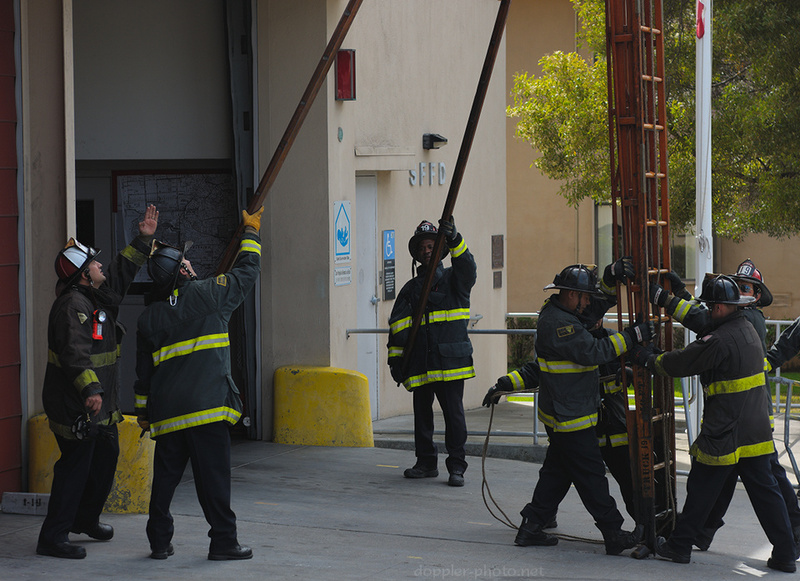 Given the height and weight of the ladder (around 350 lbs), controlling the ladder from the ground requires a carefully-choreographed sequence of braces and pivots, as two firefighters use long poles to apply leverage to the top of the static section. Here, an officer directs one of the pole-handlers as another firefighter finishes retracting the extending portion of the ladder. 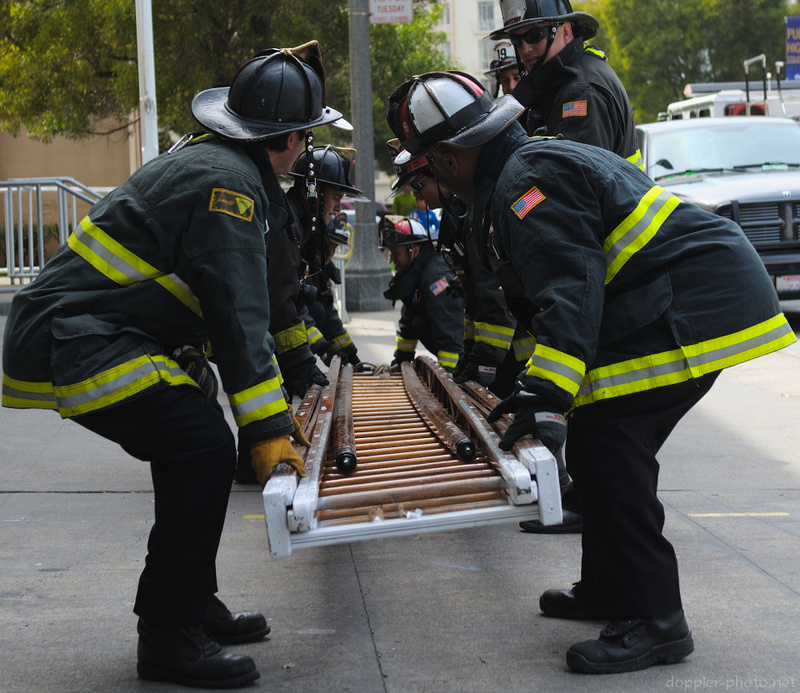 The group would then pivot the ladder 90 degrees (rhr spin-down) in order to bring the ladder down to the ground on the sidewalk. "Poles, dig in!" is the command, as leverage amplifies the amount of force required to keep the ladder from falling. Shortly thereafter, the firefighters beneath the ladder took the weight, and lowered it to the ground. The poles were detached and placed on the rungs of the ladder for storage. "Waist! Shoulder!" Six firefighters lift the retracted ladder and prepare to stow it away as a lieutenant looks on. And back it goes… The red/white helmets denote members of a truck (ladder) company, and the black helmets are from an engine company. After the exercise was over, we had a chance to chat with the firefighters. 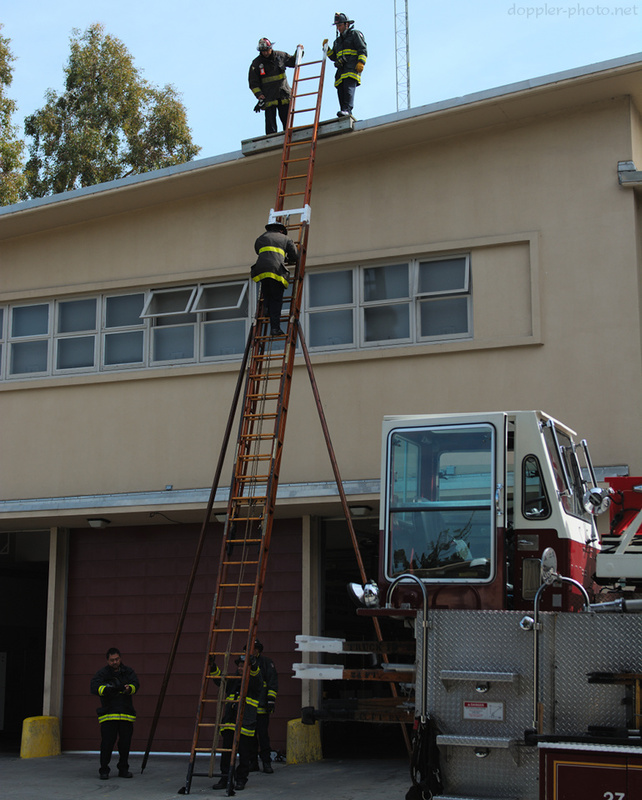 It turns out that the 50-foot wooden ground ladders are an SFFD exclusive — they are manufactured and maintained by the department itself, at a shop which resides in San Francisco. 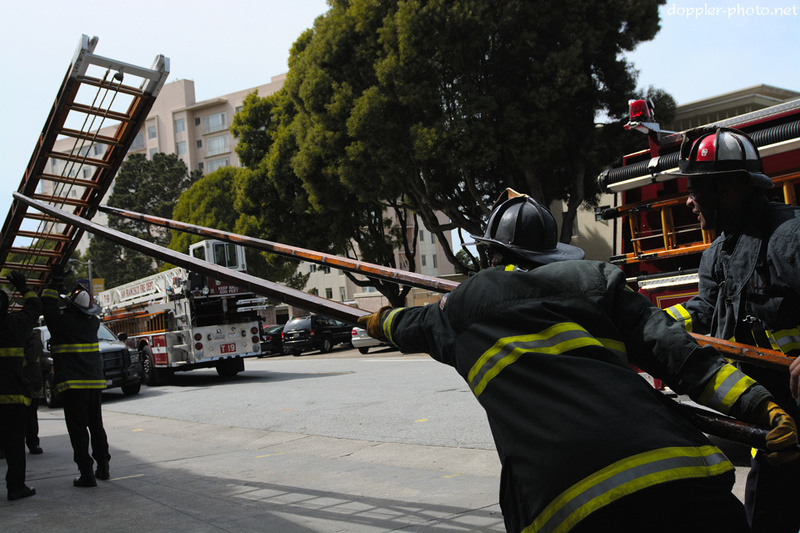 And while the majority of fire departments around the country have switched to aluminum or fiberglass ladders, the extensive network of electrical wiring above the SF streets is among a variety of reasons that SFFD has stuck with wood.